How to handle bad days and failed plans when training a young horse. Lots of questions here! I will attempt to tackle them all. When I go out to work a horse, like Jac, I generally have a plan in mind. That plan is based on the last several rides as well as a plan that I have formulated through years of riding horses. I do know for sure that I have gotten better over the years at making a realistic plan for the next day. Much of the lessons I learned about planning the next day came from my early training days. In those days I made mistakes in my goals. And I misread my horses. And I kept trying and learned from my mistakes. One possible part of the answer to your question is that if you have less experience you may have a plan, or goal, that isn’t as realistic. The other thought is that you may have possibly misread the past few rides to see the direction your horse was headed. Jac was pretty much what you saw on the videos. If anything more exciting had happened I would have put it in (because it makes great watching:) but there were not major glitches that were not caught on video. There were no big, bad days that were not on there. Jac did get consistently better (Episode 3 was pretty rough) but that is probably due to 1) my program and 2) my ability to read the horse. 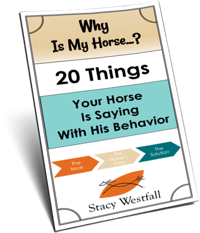 Horses that are messing with you are usually tell you that YOU need to mess with them. Be proactive with the intensity and duration of your workouts. It should also be noted that the training cycle works best with a minimum of three times a week, but five or six times a week will make training go faster. If your horse gets worked two times a week or less the training cycle won’t be as effective and, although you can still progress, there is often a feeling of starting over again. One last thought: From my past experience of teaching people in long term situations, they tend to get more frustrated when they ‘run out’ of ideas. This fits back in with my first comment about having a plan (and we learn from failed plans). Over years of training I have picked up more mental ‘tools’ which allows me to be creative and flexible. At this point I either have an idea or I am excited by the challenge so I experience much less frustration due to experience. 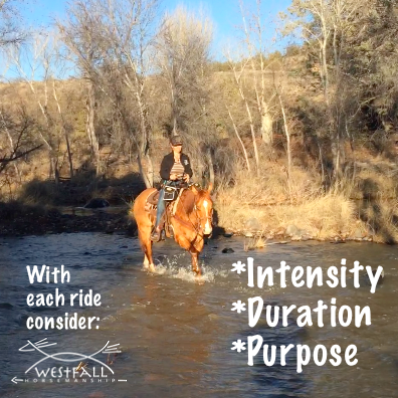 Try varying your level of intensity and duration on purpose (see above links to training cycles) and remember to breath. If you begin to get frustrated take a deep breath and remember that even when things aren’t going where you want them to, you are still learning. Set up a video camera and record your next ride. Watch it when you get home and see if you can identify anything you are doing to exaggerate the problem. Identify what each ‘crisis’ has for a common thread. Hire a pro to give you a lesson. Video tape for your own review of how they had you handle the situation. Watch another YouTube video. Hug your horse and think of how far you have come in the last five years. Watch a video of you riding five years ago. Embrace learning. I have taught my horse to bow but I was wondering how to make him stay down until I ask him to get up? not sure if this question was posted in the right spot, if not , my bad sorry! I am the “OP”. Just for clarifying, I get very little time with my horse, unfortunately. I’m lucky when I can ride three short sessions a week, usually more one or two, on week ends only. He’s pent up a lot, which I hate, but which will also change shortly. I do have a monthly session with a an excellent coach and that has helped us tremendously. 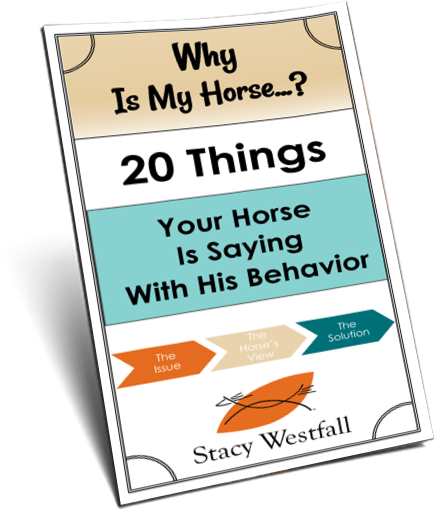 I totally love the part about “Horses that are messing with you are usually tell you that YOU need to mess with them”, this is so brilliiant !! I will start training in cycles and get him to wet his saddle pad a tad more, that should help ! Just an excellent article Stacy! The three concepts you covered: “Training cycles, Messing with you, Running out of ideas and frustrated” are just Golden and very well written. I hope the folks reading your article take time to soak up what you are saying. I did.